Sgt. Thomas hesitantly re-emerged last week after catching a commercial for the movie World Trade Center. US Marine who helped find a pair of police officers buried in the rubble at the World Trade Center on 9-11. 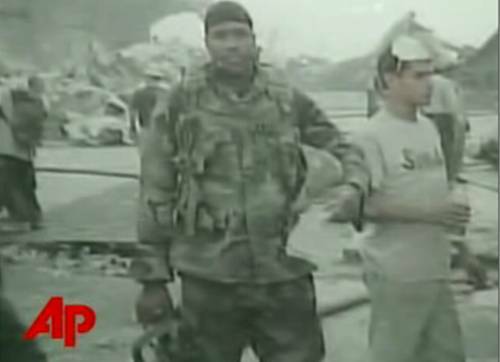 For years, authorities wondered about the identity of a U.S. Marine who appeared at the World Trade Center on Sept. 11, 2001, helped find a pair of police officers buried in the rubble, then vanished. The puzzle was finally solved when one Jason Thomas, of Columbus, Ohio, happened to catch a TV commercial for the new movie a few weeks ago as he relaxed on his couch. 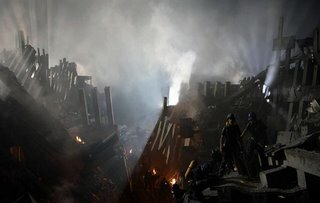 His eyes widened as he saw two Marines with flashlights, hunting for survivors atop the smoldering ruins. “That’s us. That’s me!” thought the New York native, now working as a court officer in Ohio’s Supreme Court. Thomas, 32, hesitantly re-emerged last week to recount the role he played in the rescue of Port Authority police officers Will Jimeno and Sgt. John McLoughlin, who were entombed beneath 20 feet of debris when the twin towers collapsed. Now a father of five, Thomas had been out of the Marine Corps for about a year when the terrorists struck. He was dropping a daughter off at his mother’s Long Island home when she delivered the news. “My mother insisted it must be an accident,” he said. Thomas believed differently. 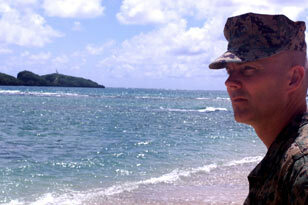 Rushing to his car, he dug in his trunk, retrieved his Marine uniform and put it on. Minutes later, he was speeding toward Manhattan, eventually finding himself on the West Side Highway following a convoy of police cars. He had just parked when one of the towers collapsed. “All I saw was ash. Ash coming in my direction,” Thomas said. As it billowed around him, he knelt by the side of his car and pulled his shirt up over his mouth. Then, he got up and ran at the center of the cloud. Thomas spent hours putting people on stretchers and setting up triage stations before bumping into another ex-Marine, Staff Sgt. David Karnes. Like him, Karnes had also grabbed his fatigues and headed into Manhattan when he learned of the attacks. Here is Sgt. 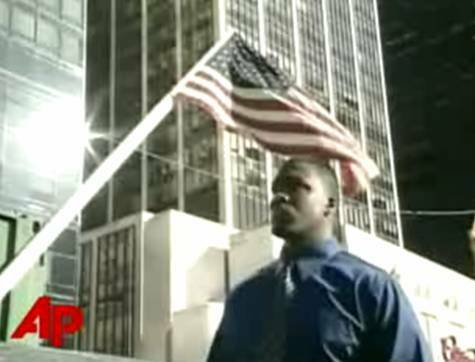 David W. Karnes’s heroic story as depicted in World Trade Center. More of this remarkable story HERE. Related… OPFOR has the news and pictures from the new Air Force Memorial. And… Open Fire has very powerful downloadable files- wallpaper and audio files for you. The Anchoress has news of an outrageous pep Rally with Bill Clinton and Billy Crystal from the other night. Pajamas Media has a tribute to Barbara Olson by Michael Ledeen up today. Ideas for More Dramatizations from the Clinton Era from Doug Ross. You can Support the Pentagon Memorial Fund. Michelle Malkin points out the moving 2996 Project. Margaret Thatcher paid her respects today. Operation Undergarment is raising money for a wounded soldier today! Allen Roth at One Jerusalem shares the story of Waleed Iskandar, a passenger on American Airlines Flight 11. Parisians will gather later in the day to remember. Roger L. Simon takes a look back on how 9-11 forever changed him and us. TigerHawk has a moving tribute. Musing Minds has the 2996 List in pdf format. John Stephenson speaks of his day in Kuwait 5 years ago. Al Qaeda released new warnings today. Pajamas Media has it all.